ReNotifier is a web app with an easy-to-use interface that allows you to easily create, send & track different types of Facebook Notifications to users who have connected to your site, app or game with their Facebook profiles. 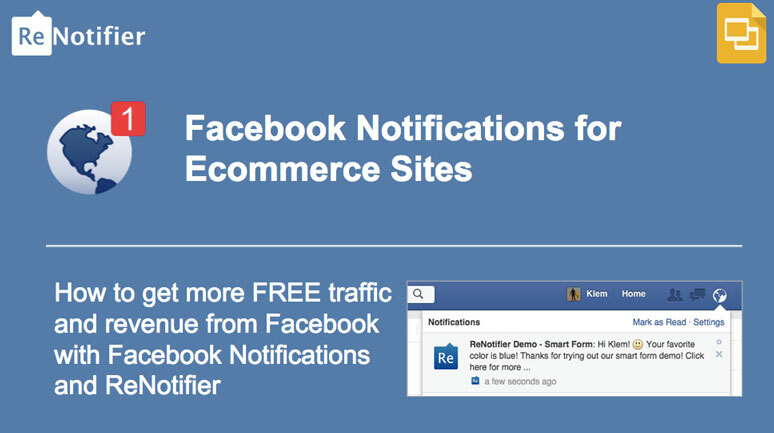 Facebook Notifications - A new way for businesses & marketers to reach & (re)engage users on Facebook for FREE. Facebook Notifications are one the most responsive marketing channels on the planet with up to 90% open rates & up to 50% click rates! 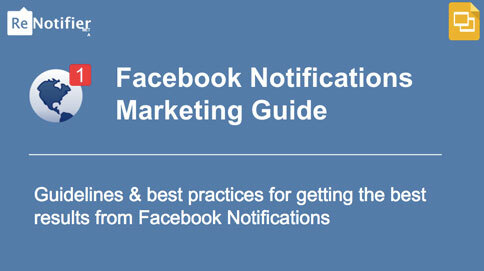 By adding Facebook Notifications as another channel to your marketing mix, you can reach & engage more users on Facebook for FREE, drive them back to your site, app or game, and get better ROI from your marketing efforts. With ReNotifier you can create, send & track different types of Facebook notifications to your users who have connected to your site, app or game with their Facebook profiles. Make your site, app or game use ReNotifier API to automatically send laser targeted 1:1 notifications to Facebook users based on their behaviour and what they do (or don’t do) on your site or in your app or game. Automatically send a sequence of pre-written 1:1 notifications at predefined time intervals to new users after the user has been added to ReNotifier. Great for followups and engaging new users. Let your marketing staff send highly targeted 1:many notifications to one or more user segments. Write a message, set a destination URL, select the User segments to include and exclude from sending, and hit Send. Let ReNotifier send your Broadcasts on your behalf at any future date and time you specify. Triggers - Make your site, app or game automatically send laser targeted 1:1 Facebook Notifications to Facebook users based on their behaviour (what they do or don’t do) on your site, app or game. 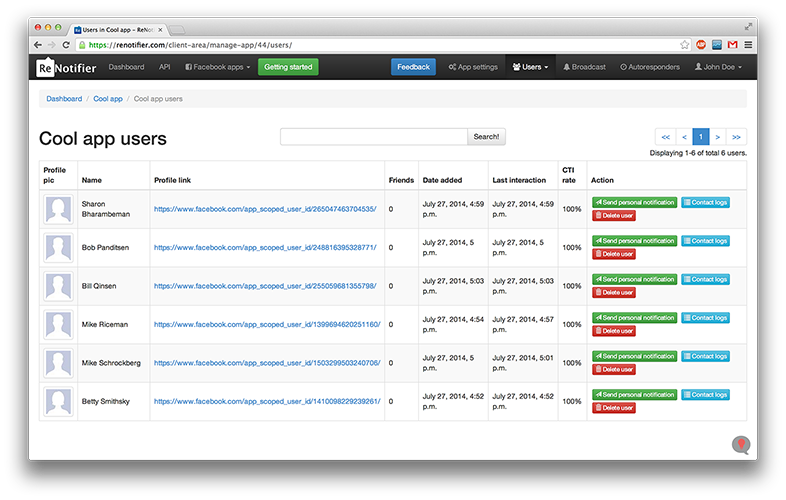 If you allow users to register or Login onto your site, app or game with their Facebook profiles, you will love Triggers! of your site, app or game. 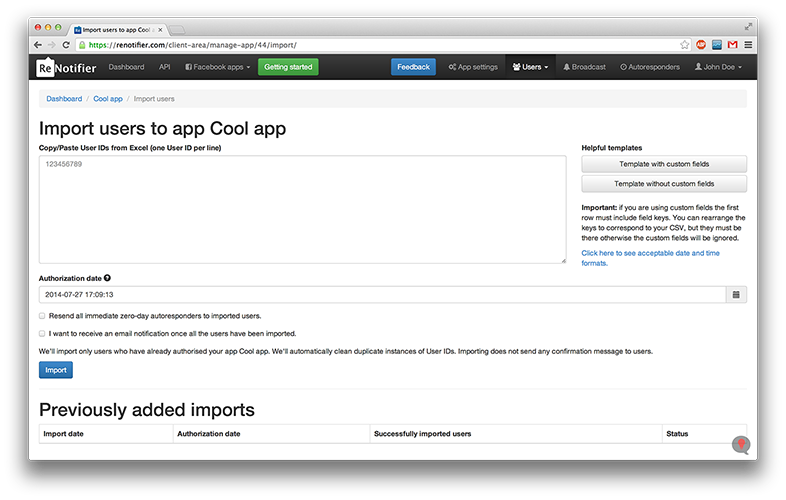 ReNotifier’s easy-to-use interface enables smooth collaboration between your marketing staff (who plan and create Triggers) and your developers (who implement ReNotifier’s API code snippets). When a user reaches your order page, but leaves and abandons your site without buying. Woah, %first_name%, did something get in your way? Click here to checkout and finish your order. The marketing staff enters the Triggers into ReNotifier. The staff sends a link to the web page with step-by-step instructions and exact code snippets to developers for quick implementation. The developers implement the code snippets into the logic of your site, app or game. 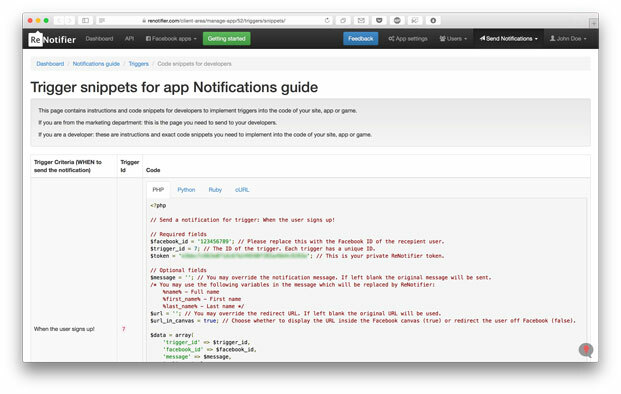 Your site, app or game starts triggering and sending Facebook Notifications. Autoresponders - Automatically send a sequence of pre-written 1:1 Facebook Notifications to new users at predefined time intervals after the user has been added to ReNotifier. Autoresponders are great for sending follow-up Facebook Notifications to new users, engaging and building a relationship with them. 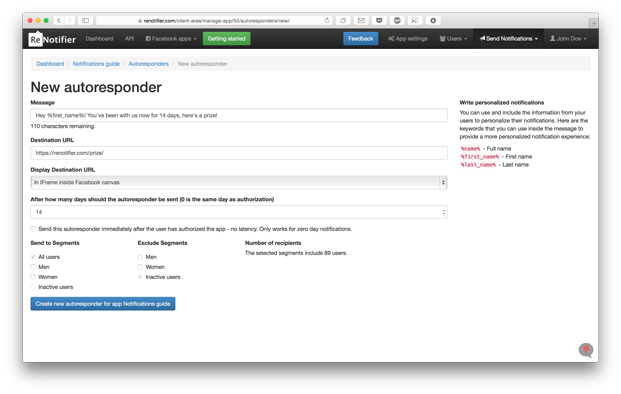 Autoresponders are a great way of driving new users back to your site, app or game. All on a complete autopilot. After the user has been added to ReNotifier, you can send him/her a sequence of pre-written 1:1 Facebook Notifications at predefined time intervals. Similar to email newsletters, Broadcasts lets your marketing staff send targeted 1:many Facebook Notifications to one or more user segments you define. 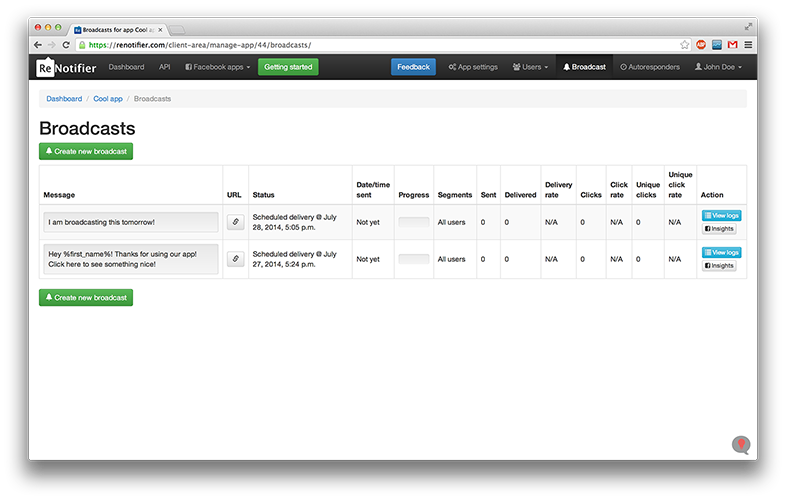 Write a message, set a destination URL, select the User segments to include and exclude from sending, and hit Send. Adding Facebook Notifications to your existing marketing channels to reach and engage your user base on Facebook might be the smartest marketing move you did this year. Here’s how to start sending Facebook Notifications using ReNotifier. 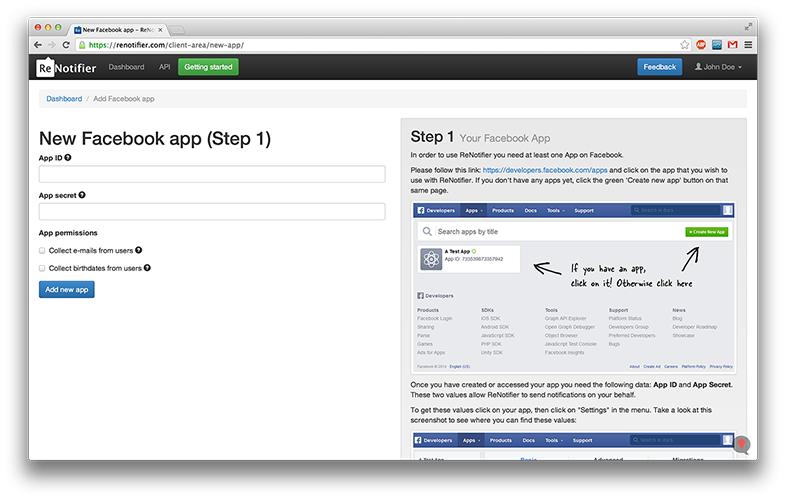 Integrate Facebook Login Dialog to your registration, opt-in and lead capture forms and flows. Let users register, sign up, log in, sign in, subscribe or opt-in using their Facebook profiles. 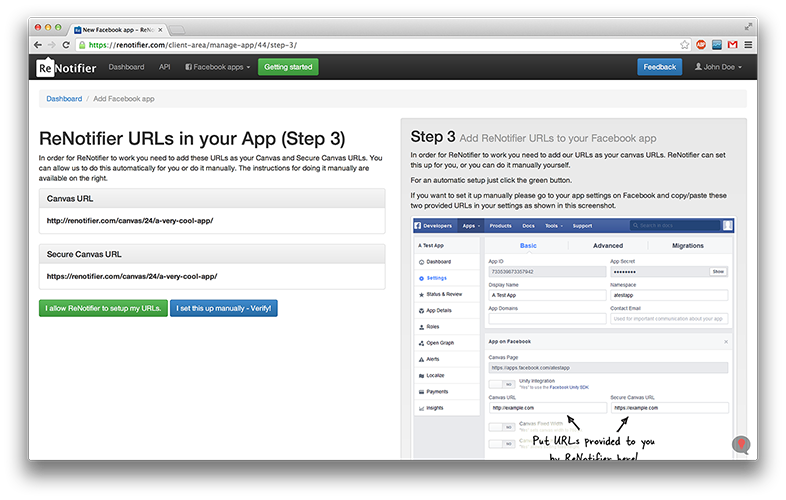 Use ReNotifier API to make your site, app or game automatically add users to ReNotifier when they register, sign up, log in, sign in, subscribe, download or opt-in using their Facebook profiles. 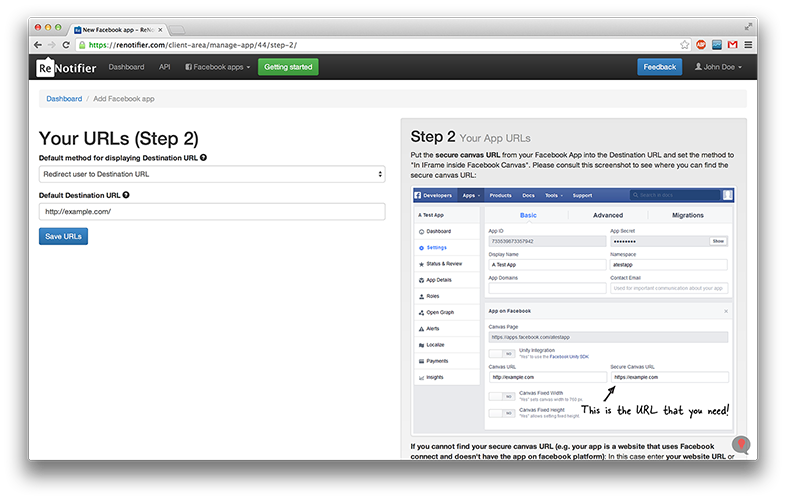 You can also manually import a list of UIDs of Facebook users. Use Triggers, Autoresponders, Broadcasts and Scheduled Broadcasts to create, send & track Facebook Notifications to your users. Easily integrate ReNotifier with your site, apps, games and forms. 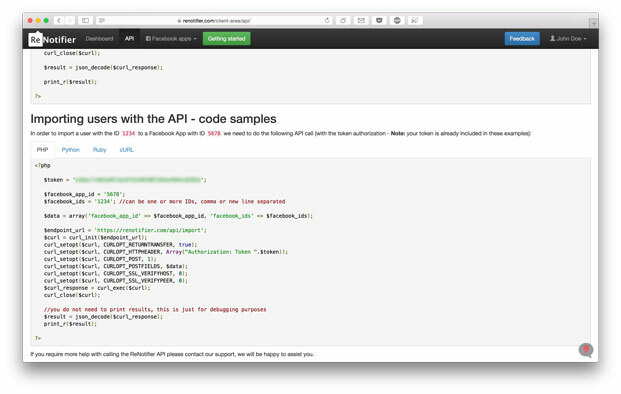 You developers and marketing staff will love ReNotifier API. 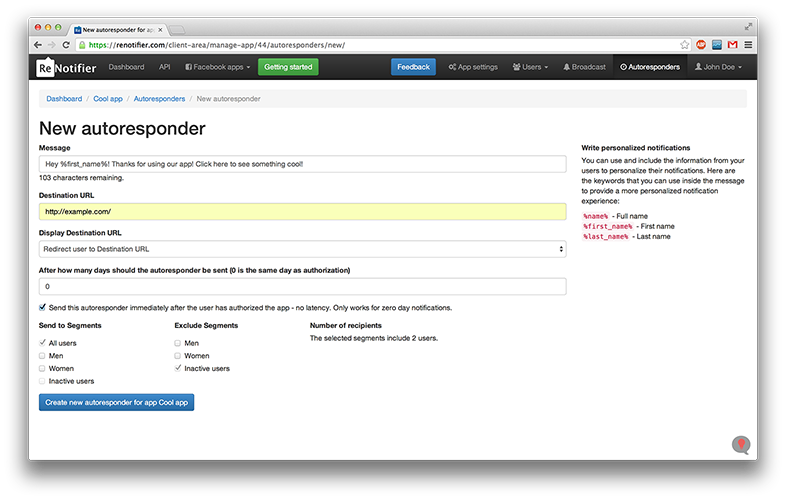 ReNotifier API lets you quickly & easily integrate ReNotifier with your site, apps, games and forms. 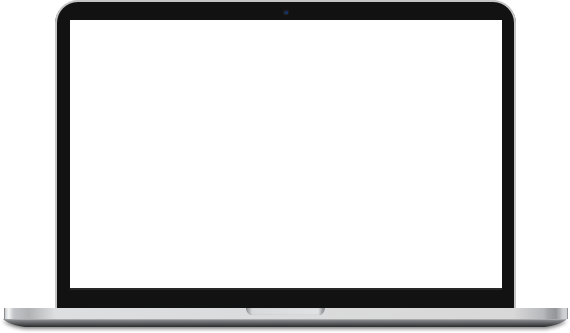 ReNotifier’s easy-to-use interface enables smooth collaboration between your marketing staff and your developers. Your marketing staff can easily create any type of Notifications in ReNotifier’s web interface, and then easily send the instructions and exact code snippets to your developers for quick implementation. See the screenshots of the ReNotifier client area. FREE plan is great if you're you want to quickly test ReNotifier and sending Notifications. 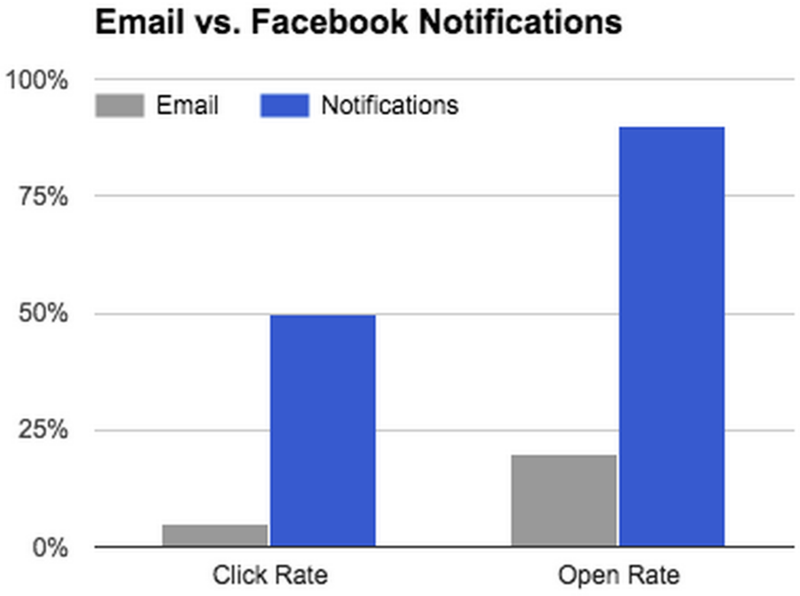 20 Google Slides of best practices of how to get high click rates and awesome engagement using Facebook Notifications. 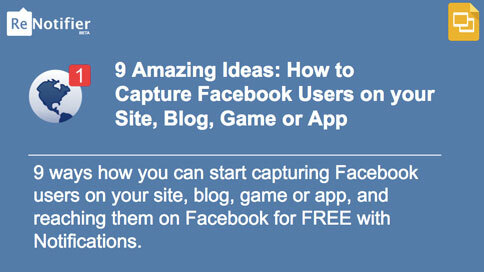 18 Google Slides on how to use Facebook Login Button to capture Facebook users on your site, blog, game or app so you can reach them on Facebook for FREE using Facebook Notifications. Download ready-to-use templates of lead capture forms with built-in Facebook Login Dialog and integration with ReNotifier. These templates are a perfect reference for your developers so they don’t have to write the code from scratch. Try ReNotifier for FREE & see the demo. In order to demonstrate the features of ReNotifier we recommend you login using the Connect with Facebook button. You can also sign up or log in with your email here! Please select... We have a web app, game or website that lets users register / log in with their Facebook profiles. We have a mobile iOS or Android app or game that lets users register / log in with their Facebook profiles. We are Facebook Game developers. We develop and/or host one or more games on Facebook. We are Facebook App developers. We develop and/or host one or more apps on Facebook. We are a marketing/advertising agency.